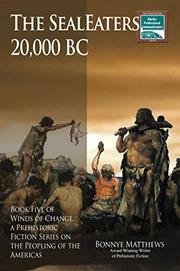 An epic novel examines a possible prehistoric immigration to the Americas. In this volume, Matthews (Tuksook’s Story, 2014, etc.) introduces a group of heroes who call themselves the SealEaters, who need to leave their coastal home before encroaching glaciers push them into the sea. An expedition sets out to inspect the land on the far side of the ocean in search of a new home. When the members reach land, they split up—not least because Reg, the leader, is abusive and hated—and subsequent chapters follow their individual paths. In one section, a SealEater named Murke assesses the terrain: “We loved the great grassland, but it was very time consuming to cross it to the land where the trees began. It was, we thought, not a place for the SealEaters to live. We needed to have the closeness of forest.” The SealEaters encounter tribes already living in the area, some hostile and others willing to welcome the immigrants. The SealEaters teach their hosts how to make their unique spear points, and several marry into the communities they find. Others return to bring the rest of their people to the new world, and find that the tribe has grown stronger thanks to Reg’s absence. Matthews, a thorough researcher, draws a detailed portrait of ice age life, particularly as she narrates the creation of the spear points: “He twisted the stone back and forth looking across the edges he’d made. He’d cease tapping and rub briskly a stone across the newly formed edge to dull it.” The prose, however, is often disjointed (“She smiled. She made the sign for breaking a stick or bone. She shook her head negatively”; “He was reaching the end of his patience and available points to make”) and some of the primitive terminology (“thinking place” for “mind” and “go black” for “sleep”) can be grating. Readers seeking dynamic female characters will not find them among the primarily male protagonists, who engage with the women as wives to be taken. Despite these flaws, Matthews has produced an adventure story that plausibly explores a leading theory of human migration, bringing an imagination to the scant facts contained in the archaeological record. The multitude of characters moves the book in the direction of a saga, allowing it to represent a wide experience of prehistory. An engaging, though unpolished tale of an ice age migration.